For each of us who love this kind of music, there will always be songs so personal, no one else can understand why they move us. They recall a time, a place, a love. 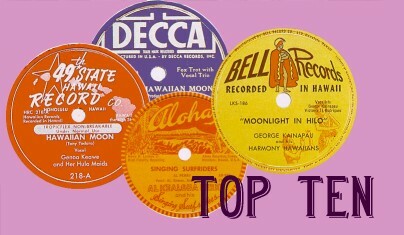 But among the thousands of Hapa Haole songs, some stand out for their poetry, haunting music and imagery. Some are wonderfully silly and make you smile. There are some of both kinds in this--highly personal--list. Because I grew up listening to the radio program and longing for the Islands. Because Aunty Clara was my all-time favorite performer. Probably the finest Hapa Haole song ever written. It's a lovely song and also because John Saclausa, pianist extraordinaire at the Green Turtle, Eagle's Nest and Canlis, always played it for my friend Gard Kealoha. This song always comes to mind as the plane approaches Diamond Head when I've been away. A great hula and a fun song. Who can resist a song with these lyrics? Brings back memories of 11 unforgetable trips on the S. S. Lurline. 'The grand manner of Matson' really was.
. . . and all the lei songs. The opinions expressed here are solely those of the author of this website.